Looking for useful and cheery favors that add a little something special to your guests’ day? 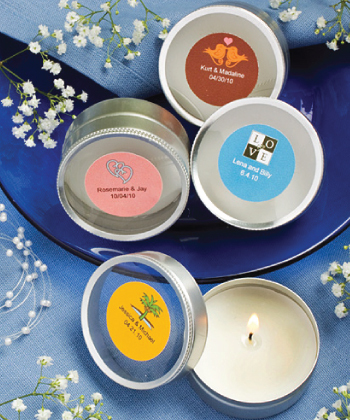 Well, these scented travel candles are literally like a breath of fresh air! And, because they’re part of Fashioncraft’s exclusive Personalized Expressions Collection, you can choose from an exceptional selection of colors, themes and customized titles, for weddings, showers, or any occasion, to turn them into one-of-a-kind treasures. Each 2” diameter x 1” tall round candle features a silver metal base and a clear plastic top that allows you to see the white scented candle within and is also perfectly fit for the custom label of your choice. A sweet smelling sensation, these favors come bulk packed with self sticking label sheets included for easy application. Please allow 3-4 days for production. Due to personalization, you must order at least 40 favors.